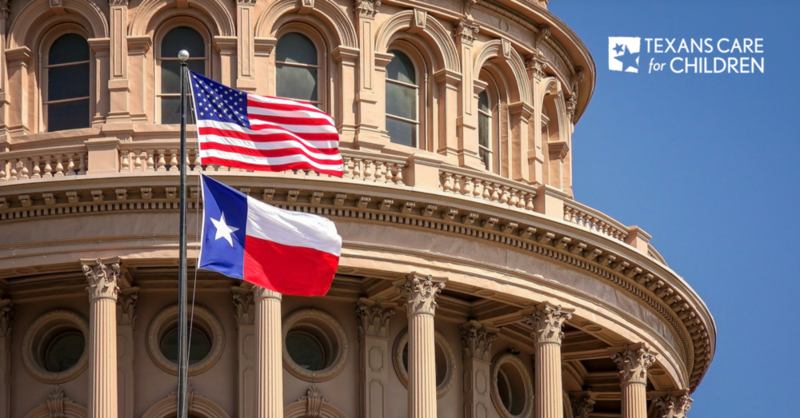 Austin - The Texas Education Agency (TEA) has released its Legislative Appropriations Request (LAR) for fiscal years 2020-2021, requesting an additional $54 million for a Safe and Healthy Schools Initiative. The request envisions the creation of a "Safe and Healthy Schools technical assistance program to provide guidance and assistance to schools as they work to improve their mental health coordination and supports and school culture assessment pillars," a concept that Texans Care for Children has urged state leaders to implement. TEA's request comes in response to calls from the Governor, Legislature, school leaders, and others to ensure Texas has safe and supportive schools following the tragic shooting at Santa Fe High School. Those policy discussions — as well as policy discussions about supporting Gulf Coast communities affected by Hurricane Harvey and policy discussions about improving student health, behavior, and academic performance — have emphasized student mental health has a high priority. During the last several months, Texans Care for Children has testified numerous times to the Legislature on student mental health policies and published multiple resources on the subject. Those materials are available here. The Legislature uses LARs from state agencies to craft the first draft of the next state budget, which will be considered during the upcoming legislative session. "We appreciate and support the Texas Education Agency's leadership in articulating the need for greater technical assistance and funding for school districts to develop safe and supportive schools. "The request is a good start. We are optimistic that legislators will provide additional funding beyond this proposed down payment in order to meet the significant student mental health needs that state and local leaders have identified in recent months. "Some school districts may opt instead to use the proposed funding to expand the presence of school police officers. With the increase in school police officers, the Legislature should ensure that the role of officers is limited to school security. Clearly defining the role of officers is important for ensuring student safety and preventing school personnel from requesting that officers intervene in cases of minor misbehavior. It will also be important for the Legislature to ensure the state starts collecting data on the use of school police officers and their interactions with students." The Safe and Healthy Schools Initiative is built upon a multi-tiered systems of support framework and grounded in four primary pillars. This initiative serves both traditional ISDs and Charters. • Mental Health Supports: access to counseling resources, mental health professional networks, threat assessment protocols, and teacher and administrator training on mental health needs. • Positive School Culture: character education, positive behavior supports and interventions, trauma-informed education, restorative discipline practices, suicide prevention, resiliency, anti-bullying, and anti-cyber-bullying. This would include programs to encourage student, family, school staff and community engagement. • Facility Safety: facilities hardening and the presence of School Resource Officers (SROs) and school marshals on a campus. • Emergency Response Coordination: police collaboration, drills, training on crisis and emergency response, and notification protocols. This would include programs to encourage school presence of law enforcement on a regular (non-incident caused) basis. • Safe and Healthy Schools Self-Assessment Rubric: TEA and the Texas School Safety Center (TxSSC), will develop a best practices framework and associated rubric to help districts self-assess and identify areas for improvement in school safety, including mental health supports. TEA will provide technical support based on those rubrics and safety and security audits. • State and regional level technical assistance: TEA and the regional Education Service Centers (ESCs), will set up a Safe and Healthy Schools technical assistance program to provide guidance and assistance to schools as they work to improve their mental health coordination and supports and school culture assessment pillars. • Fast-Track to Safer Schools Grants: TEA would develop grants to assist school districts in their deficiencies of any of the four pillars.